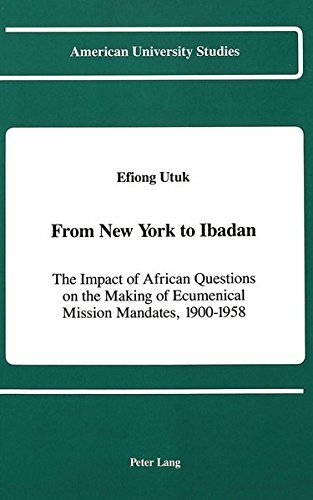 This book focuses on the Ecumenical Movement with particular emphasis on Africa's impact on the making of ecumenical mission mandates during the formative years, 1900-1958. Previous studies have mainly focused on the Continents of Europe, North America, and Asia, with Africa seen as inactive during these years. By contrast Dr. Utuk concentrates on the problems which helped to give birth to the Movement, with Africa seen as an indispensable ecumenical partner. This fresh perspective emerges through an analysis of sixteen conferences based on six fascinating themes, including the role played by several, hitherto unknown, native African and African-American pioneer ecumenists. Utuk's evidence and arguments will be of great interest to historians, social scientists and all those concerned with the future of Christianity and ecumenism in our modern world.